Exeter-Milligan faculty and staff posed for a photo at the HUMANeX conference in Kalamazoo, Mich. Pictured from the left are: Denice Kovanda, Laura Kroll, Marla Weber, Katherine Roemmich, Laura Steuben, Treven Cerveny, Lisa Soukup, Shelli Mueller and Paul Sheffield. Two years ago Exeter-Milligan Superintendent Paul Sheffield “had a gut feeling that things just didn’t seem right” with the staff, faculty and students in the school district. Around that same time Sheffield was at an administrator’s day and was introduced to the vendor HUMANeX which help companies and schools evaluate their relationships and community. Last year, between teachers resigning and changing campuses, four new teachers were hired for the Milligan campus. “It’s really a way for us to get a pulse on the organization as a whole and makes improvements,” explained Sheffield. These goals are those that HUMANeX found through the survey given to all of the teachers. 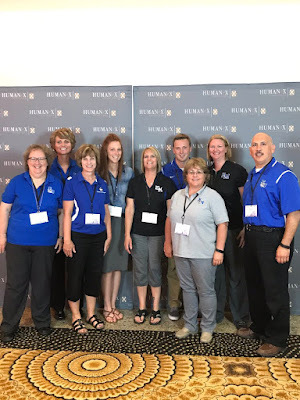 In June, nine teachers and staff at Exeter-Milligan took the HUMANeX sponsored trip to Kalamazoo as well as Sheffield, Kroll and Guidance Counselor Denise Kovanda presented at the conference. Sheffield emphasized that the positive responses he received from representatives of large corporations after the presentation confirmed that the district was seeing the results of their interactions with HUMANeX. While the Exeter-Milligan administrators presented at the conference, the teachers served as a panel for the session. Mueller enjoyed fielding questions from the audience. During the conference HUMANeX recognized the progress at Exeter-Milligan calling Sheffield on stage and presenting him with a set of John Gordon books.